For our data analysis example, we will expand the third example using the hsbdemo data set. Let’s first read in the data. The data set contains variables on 200 students. The outcome variable is prog, program type. The predictor variables are social economic status, ses, a three-level categorical variable and writing score, write, a continuous variable. Let’s start with getting some descriptive statistics of the variables of interest. Alternative-specific multinomial probit regression: allows different error structures therefore allows to relax the independence of irrelevant alternatives (IIA, see below “Things to Consider”) assumption. This requires that the data structure be choice-specific. Below we use the mlogit command to estimate a multinomial logistic regression model. The i. before ses indicates that ses is a indicator variable (i.e., categorical variable), and that it should be included in the model. We have also used the option “base” to indicate the category we would want to use for the baseline comparison group. In the model below, we have chosen to use the academic program type as the baseline category. A one-unit increase in the variable write is associated with a .058 decrease in the relative log odds of being in general program vs. academic program . A one-unit increase in the variable write is associated with a .1136 decrease in the relative log odds of being in vocation program vs. academic program. The relative log odds of being in general program vs. in academic program will decrease by 1.163 if moving from the lowest level of ses (ses==1) to the highest level of ses (ses==3). The ratio of the probability of choosing one outcome category over the probability of choosing the baseline category is often referred to as relative risk (and it is also sometimes referred to as odds as we have just used to described the regression parameters above). Relative risk can be obtained by exponentiating the linear equations above, yielding regression coefficients that are relative risk ratios for a unit change in the predictor variable. We can use the rrr option for mlogit command to display the regression results in terms of relative risk ratios. The relative risk ratio for a one-unit increase in the variable write is .9437 (exp(-.0579284) from the output of the first mlogit command above) for being in general program vs. academic program. The relative risk ratio switching from ses = 1 to 3 is .3126 for being in general program vs. academic program. In other words, the expected risk of staying in the general program is lower for subjects who are high in ses. We can test for an overall effect of ses using the test command. Below we see that the overall effect of ses is statistically significant. More specifically, we can also test if the effect of 3.ses in predicting general vs. academic equals the effect of 3.ses in predicting vocation vs. academic using the test command again. The test shows that the effects are not statistically different from each other. You can also use predicted probabilities to help you understand the model. You can calculate predicted probabilities using the margins command. Below we use the margins command to calculate the predicted probability of choosing each program type at each level of ses, holding all other variables in the model at their means. Since there are three possible outcomes, we will need to use the margins command three times, one for each outcome value. 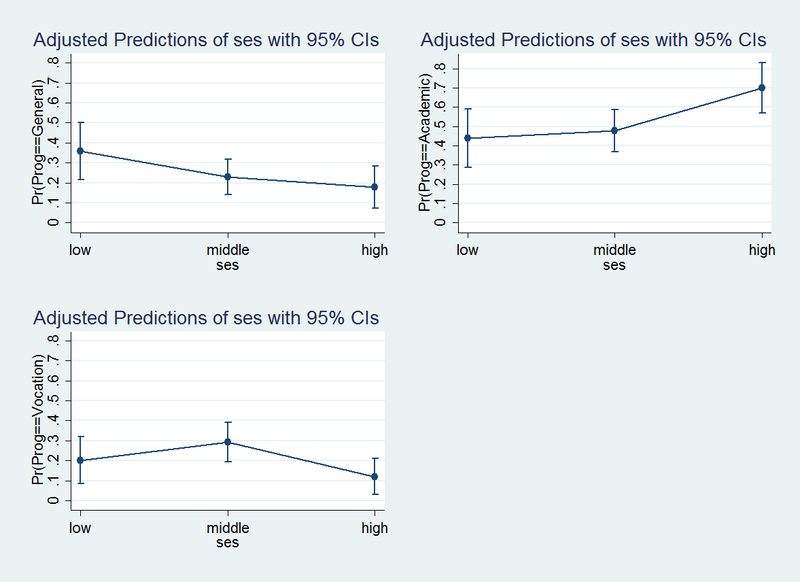 We can use the marginsplot command to plot predicted probabilities by ses for each category of prog. Plots created by marginsplot are based on the last margins command run. Furthermore, we can combine the three marginsplots into one graph to facilitate comparison using the graph combine command. As it is generated, each marginsplot must be given a name, which will be used by graph combine. Additionally, we would like the y-axes to have the same range, so we use the ycommon option with graph combine . Another way to understand the model using the predicted probabilities is to look at the averaged predicted probabilities for different values of the continuous predictor variable write, averaging across levels of ses. Sometimes, a couple of plots can convey a good deal amount of information. Below, we plot the predicted probabilities against the writing score by the level of ses for different levels of the outcome variable. We may also wish to see measures of how well our model fits. This can be particularly useful when comparing competing models. The user-written command fitstat produces a variety of fit statistics. You can find more information on fitstat and download the program by using command search fitstat in Stata (see How can I use the search command to search for programs and get additional help? for more information about using search). The Independence of Irrelevant Alternatives (IIA) assumption: roughly, the IIA assumption means that adding or deleting alternative outcome categories does not affect the odds among the remaining outcomes. Test of the IIA assumption can be performed by using the Stata command mlogtest, iia. However, as of April 23, 2010, mlogtest, iia does not work with factor variables. There are alternative modeling methods that relax the IIA assumption, such as alternative-specific multinomial probit models or nested logit models. Diagnostics and model fit: unlike logistic regression where there are many statistics for performing model diagnostics, it is not as straightforward to do diagnostics with multinomial logistic regression models. Model fit statistics can be obtained via the fitstat command. For the purpose of detecting outliers or influential data points, one can run separate logit models and use the diagnostics tools on each model. Pseudo-R-Squared: the R-squared offered in the output is basically the change in terms of log-likelihood from the intercept-only model to the current model. It does not convey the same information as the R-square for linear regression, even though it is still “the higher, the better”. Complete or quasi-complete separation: Complete separation implies that the outcome variable separates a predictor variable completely, leading to perfect prediction by the predictor variable. Unlike running a logit model, Stata does not offer a warning when this happens. Instead it continues to compute iteratively and requires a manual quit to stop the process. Perfect prediction means that only one value of a predictor variable is associated with only one value of the response variable. But you can tell from the output of the regression coefficients that something is wrong. You can then do a two-way tabulation of the outcome variable with the problematic variable to confirm this and then rerun the model without the problematic variable. Perhaps your data may not perfectly meet the assumptions and your standard errors might be off the mark. You might wish to see our page that shows alternative methods for computing standard errors that Stata offers. Sometimes observations are clustered into groups (e.g., people within families, students within classrooms). In such cases, you may want to see our page on non-independence within clusters.